I’ve been on a mission lately. I’m trying to expose P to music. Listening and playing music has shown to develop the brain in ways like nothing else. I do not come from a musical background. I don’t know how to play any instruments, not even a recorder. I love music but have no understanding of it so this is harder for me than getting P involved in sports, art or reading. From my research, I understand that P’s brain is about to hit a mile marker. At about 2 her brain will be hardwired for good. Babies are born with excess pathways and as they mature the pathways start tapering down to the most efficient routes. With the losing of excess pathways also comes the losing of those not used. Exposure to different experiences keeps these pathways in use. When P was born I played Mozart religiously for at least an hour daily. At one that habit started to fade and now that she’s 20 months I’m on a mission to re-expose her to music. 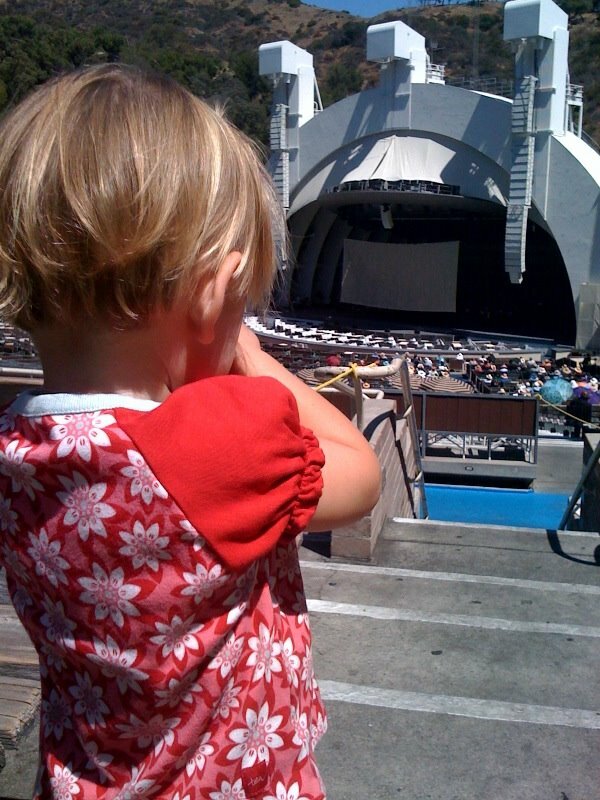 Today we hit the Hollywood Bowl for their Summer Sounds concert. This week and next they are playing the music of India. It was an amazing show of music, dance, and storytelling. I wish I would have caught the series earlier with Brazilian and Mexican music. After the concert, we picnicked while listening to the LA Philharmonic rehearse the Tchaikovsky performance for tonight’s concert. P watches an HBO series called “Classical Baby: art, music and dance for the smart baby”. They play classical and jazz music to animated works of art. So because of this P kept saying “art show” while listening to some familiar tunes. We’re going again next week and meeting up with friends. My agenda for the fall will include the Toyota Symphonies for Youth at the Disney Concert Hall.